(Atlanta, GA - January 28, 2015) The Brighter Lives for Refugees campaign returns to make a difference and create a better everyday life for the many refugees living around the world. 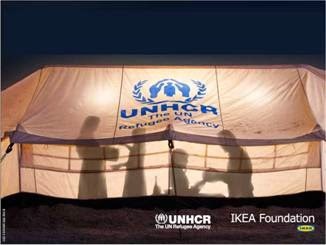 Starting February 1 and running till March 28, 2015, for every LED light bulb purchased in IKEA stores, the IKEA Foundation will donate one euro ($1.16 *) to help UNHCR light refugee camps— making them a safer, more suitable place for the families who live there. In its first year (2014), the Brighter Lives for Refugees campaign, raised $10.6 million (€7.7 million**) globally, and the US alone raised over $570,000 through IKEA co-worker and customer support. Today there are almost 13 million refugees *** under UNHCR’s care, half of whom are children. For those refugees living in camps, all livelihoods, social and educational activities usually stop after sundown, because refugee camps can be extremely dark places. Thanks to the Brighter Lives for Refugees campaign, many now have lighting and energy solutions. Part of the funds from last year’s campaign have been used to help over 11,000 Syrian refugees living in Azraq refugee camp, Jordan, by providing families with a solar-powered lantern, which can be used for mobile-phone charging and as a light source so families can carry on with their everyday activities. Solar lanterns allow girls and boys to study after dark, helping them with their education and progress in school. Lanterns and solar street lights mean that adults can continue working and communities can have social gatherings after sunset. IKEA continues to lead in sustainable business practices. In October 2012, IKEA US announced it would make a bold move to sell only LED lights in all its US stores by 2016, thereby enabling millions of people to live a more sustainable life at home and save on their energy bills. The United Nations High Commissioner for Refugees, also known as the UN refugee agency, was established on December 14, 1950 by the United Nations General Assembly. It is mandated to lead and co-ordinate international action to protect refugees and resolve refugee problems worldwide. Its primary purpose is to safeguard the rights and well-being of refugees. It strives to ensure that everyone can exercise the right to seek asylum and find safe refuge in another State, with the option to return home voluntarily, integrate locally or to resettle in a third country. It also has a mandate to help stateless people. In more than six decades, the agency has helped tens of millions of people restart their lives. I love this. I would think I would just accept the darkness, but then to have light, what a special caring gift to receive.